The Tory party and their plethora of think tanks drone on and on about institutional BBC bias in favour of left-wing views. It has been an evidence-free complaint for many years but they have now extended it to include the BBC’s election coverage which, given the implications for our democracy and the appointment of BBC hating John Whittingdale to run the department for culture, media and sport (DCMS), could lead to dire consequences for one of our nation’s key institutions. But are the Tories correct about the BBC’s biased election coverage? Here is the comprehensive independent research on media coverage of our general election by Loughborough & Cardiff Universities. The appointment of John Whittingdale as secretary of state for culture, media and sport has created speculation about the way the new government will handle the upcoming BBC charter renewal. There is concern in many quarters that this is a signal that the government may reduce – or even end – the BBC licence fee. News reports have alluded to figures in the Conservative party expressing unhappiness with the BBC’s election coverage – part of a longstanding claim amongst some Conservatives that the BBC has a left-wing tilt. Since broadcasters have a legal obligation to be impartial, this is a serious accusation. Equally serious is the suggestion – made by Labour advisor Tom Baldwin – that the Conservatives leant on senior BBC executives during the election campaign, threatening consequences if they did give the government an easier ride. In the past, of course, Blair’s Labour government put pressure on the BBC and succeeded in forcing the resignation of its director-general, Greg Dyke, over its coverage of the debate that led to the Iraq War. But this is not the first time allegations have been made about such an overt threat to the BBC’s independence. Both claims deserve serious investigation. We need a systematic and independent review of political impartiality on the BBC, as well as other broadcasters, who are bound by the same rules. In the meantime, what does the available evidence tell us about the BBC’s coverage of the election campaign? 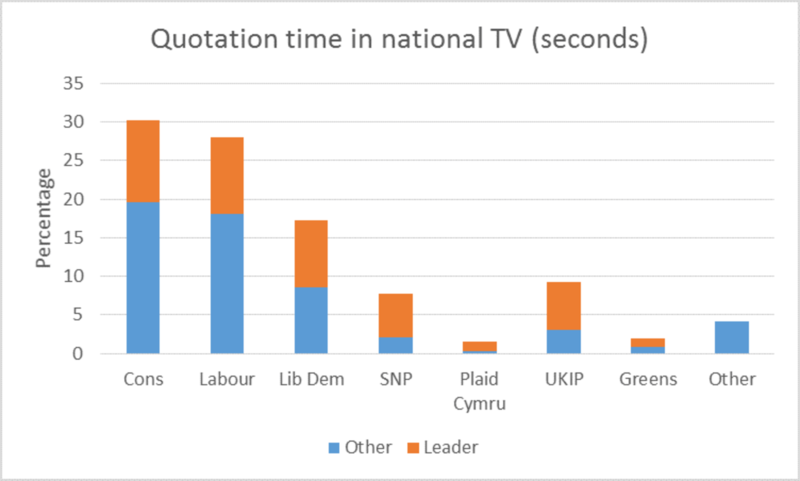 Cardiff and Loughborough – both universities with a well-established track record for independent news monitoring – conducted a week-by-week analysis of broadcast election coverage. Both studies found that the two main parties received broadly comparable volumes of coverage, with the Conservatives ahead by a small margin. By this fairly crude yardstick, then, none of the broadcasters could be accused of anti-Tory bias. The volume of coverage allotted to parties is, of course, a very blunt measure. In election campaigns, the parties battle it out to try and set the agenda, in order to highlight those issues where their records inspire the most public support. During most of 2015, most surveys put the NHS at the top of the list of people’s concerns, followed by the economy, immigration, education and housing. Surveys also showed that the Conservatives had a clear lead on the economy, while most people trusted Labour on the NHS and housing. For the two main parties, the consequences of this were fairly clear: the Conservatives put the economy at the top of their agenda, while Labour stressed the NHS. Since the polls showed both issues were top on the list of peoples’ concerns, impartiality required the broadcasters to give roughly equal time to both. Yet the Cardiff study showed that the economy received 4 times as much coverage overall as the NHS. During the crucial final week of the campaign, this gap widened. The NHS almost disappeared from the agenda, with two issues dominating: the economy and speculation about possible coalitions – notably potential deals between the Labour and the SNP – an issue pushed by the Conservative campaign in the last two weeks (bolstered by a poll for the Sun that suggested a small but potentially significant group of potential Labour voters were concerned about such a deal). 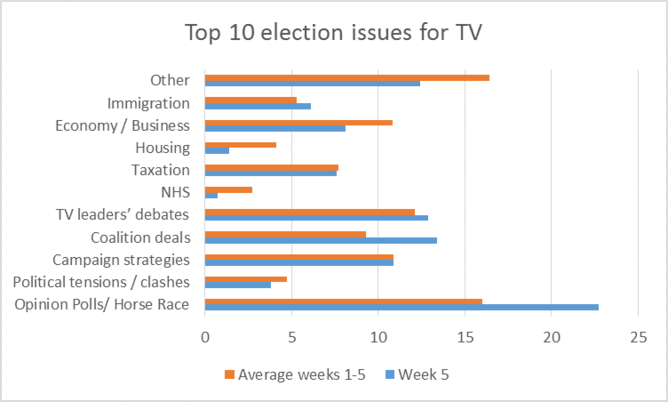 It therefore appears that the broadcasters – especially in the final week – went with a Conservative rather than a Labour agenda. Since this was true of all the UK broadcasters, this cannot be seen to be the result of political pressure on the BBC (regardless of whether such pressure was applied), or public opinion, which remained concerned about the NHS. So why did the broadcasters allow one side to so clearly set the agenda? The answer is both simple and, in terms of broadcasting impartiality, troubling. 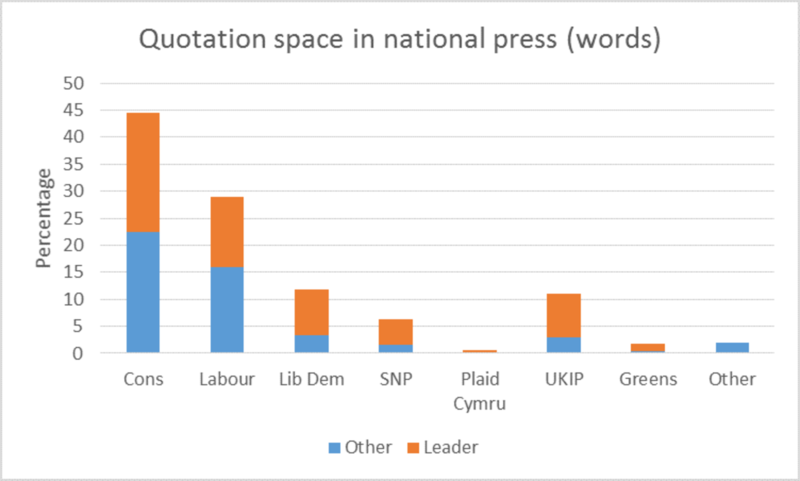 The Loughborough research, which also tracked press coverage, suggested that most newspapers were overwhelmingly partisan in favour of the Conservatives and against both Labour and the SNP – a bias that increases when weighted by circulation. 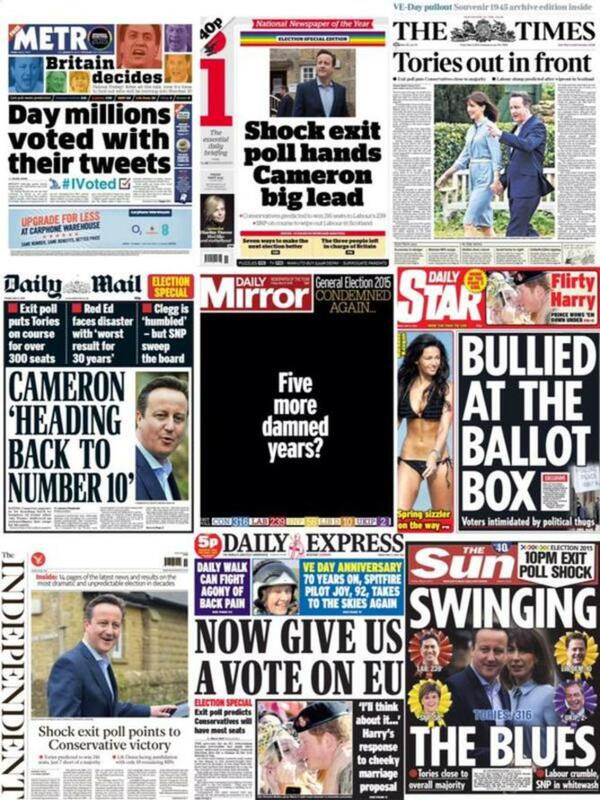 Indeed, a number of newspapers were not so much reporting the campaign as becoming part of it. The major Conservative titles followed Central Office’s lead in unison, favourably comparing the Conservative’s economic record with Labour and warning against the constitutional threat of a Labour/SNP coalition. The effect of a vociferously pro-Conservative press on the electorate has been much debated – and deserves more serious investigation than the generally ill-informed commentary it has received thus far. What the research does appear to show is that regardless of its effect on its readers, newspaper partisanship directly influenced the broadcast news agenda. Press circulation has declined in recent years, but TV news remains by far the most used – and most trusted – source of information. The fact that broadcasters seem to have taken their lead from the press suggest that the built-in Tory bias in our newspapers has found its way (albeit in a more even-handed and less overtly partisan form) into broadcast news. We saw indications of this earlier in the campaign. A poll indicating that two-thirds of leading economists disagreed with the government’s austerity measures was ignored by most newspapers and consequently received very little attention. By contrast, a letter to the Telegraph from 103 business leaders supporting the Tories became a headline story on broadcast news bulletins. While Labour’s response was also reported, the issue put them on the defensive. It would be hard to argue that the Telegraph letter was more newsworthy than the poll of economists – especially since the first was fairly unsurprising while the latter called one of the Conservative’s main claims about economic competence into question. The difference was that the press made more of it, and this appears to have shaped the judgement of broadcasters. Over the coming months, we are likely to see much debate about the impartiality of the BBC. This should be based on evidence rather than who has the loudest voice. We need more independent research and less speculation. 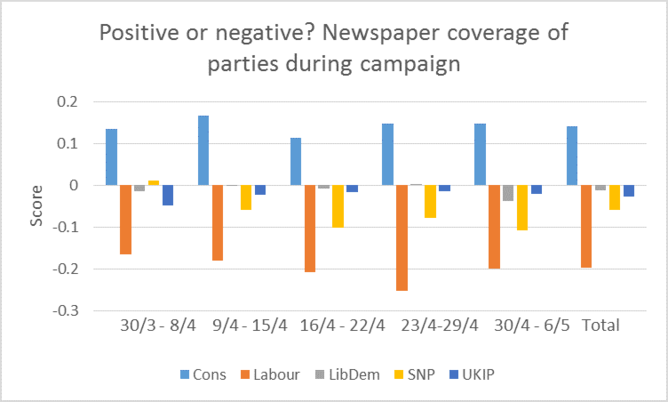 But the question raised by the election campaign is fairly clear: do our partisan press have too much influence on our broadcast news? The answer, at the moment, would appear to be “yes”. Justin Lewis is Professor of Communication at Cardiff University.